Few careers are as fulfilling as that of a school counselor, whose job includes helping and guiding a students’ educational and vocational direction. 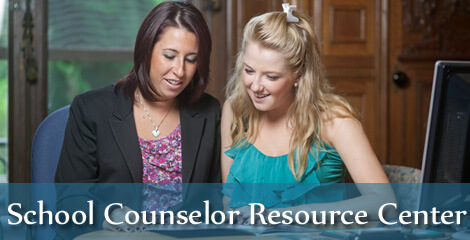 Monmouth University recognizes that the role of counseling professionals is always changing and that each academic year brings new students, challenges, and technological advancements. Monmouth stands ready to take the baton and offer your students the personalized attention you have afforded them as they take the next step in their academic journey. Modern college searches are driven by a university’s Web site, with the majority of students applying to college online. The School Counselors Resource Center (SCRC) is here to offer you some useful information that will help you to guide your students through their college search process. Register now to have instant and convenient access to your students’ application information! At any time, this simple and secure feature gives you a comprehensive look at those students from your institution who are considering Monmouth and where they are in the admission process. The Educational Opportunity Fund (EOF) Program is a state-funded program that offers an opportunity for highly-motivated, and economically and educationally disadvantaged students to attend college. Find out more about the EOF Program by visiting www.monmouth.edu/eof/. Contact Emma Caban at 732-263-5882 or send Emma an e-mail at ecaban@monmouth.edu for more details.